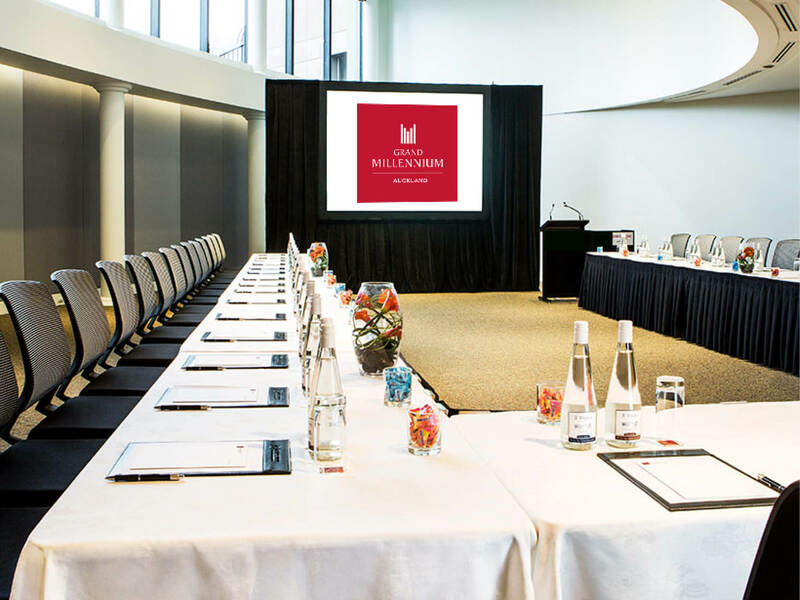 The setup of a conference room is an integral part of the conference and plays a major part in its success. This reference guide lists the various styles of conference room setups. From time to time you will need to adjust these layouts according to individual room structures. Always ensure that the visibility to the presenter and audiovisual equipment (if used) are clear from both the back and sides of the room. The objective of your meeting will determine the style of setup you select to utilise. Theatre style is an equal number of chairs in rows and columns facing the front of the room generally with a centre aisle and two side aisles to ensure easy access for delegates. Classroom style is utilizing rows of tables with chairs facing the front of the room therefore providing a writing space for each delegate. Generally trestle tables are used and accommodate either 2 – 3 delegates per table depending on the size of the table. Classroom style can also be place in herringbone shape which is simply placing the tables on an angle facing the front of the room. Banquet style is a group of round tables with chairs evenly spaced around each table. Banquet style is set to facilitate serving food and generally set for 6-10 delegates depending on the size of the round tables. A few cocktail tables (higher, bar-style tables) are scattered in the room. Recommended for social events where mingling and networking is the primary goal. U-shape is a series of tables set in the shape of the letter U, with the open end facing the front of the room. Chairs are placed around the outside perimeter of the U. A large table or a cluster of tables and chairs. Recommended when group discussion is the primary goal. Similar to banquet style, however, the round tables only have chairs placed half way around them therefore allowing all delegates to have a clear view to the front of the room.Cocktail ReceptionA cocktail reception is an open space with small drop tables or bar leaners’ scattered throughout. Generally only a few chairs are placed around the room. Food and beverage is usually tray served to delegates around the room. Like the boardroom style tables are arranged in a rectangle or square leaving the centre open. Chairs are placed around the outside of the rectangle or square. An exhibition is typically made up of display booths utilising panel boards creating a u-shape. These booths can vary in size depending on the amount of space available for the entire exhibition and the amount of space required by the exhibitor. The cost associated to the booth is related to its size. The other option to actual booths is table top displays. Trestle tables are supplied to each exhibitor and placed strategically around the room to enable easy access for delegates to view the products or services being displayed. Generally all catering breaks are served in the exhibition area providing maximum exposure for the exhibitors with the delegates.